A former Olympic weight lifter, STRETCHER now utilizes his enormous strength to carry wounded G. I. Joes to safe landing zone evacuation sites. 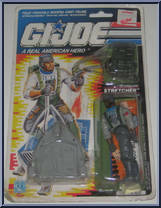 Before joining the G. I. Joe Team, Stretcher served as a front-line medic for one of NATO's roughest combat units. 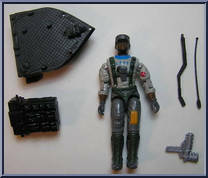 Although he is highly proficient in all the latest first-aid techniques, his primary duty is the speedy delivery of injured troops to the best treatment facility in the area. "DOC may have a medical degree from a top medical school and LIFELINE may be the next best thing to a real doctor, but if I'm wounded and Cobra tracers are buzzin' above my head, I'll breathe a lot easier knowing that Stretcher is coming to get me. The other two guys can patch you up fine and dandy, but Stretcher will definitely deliver you from danger, pronto!" Contribute pictures, update details or suggest corrections for Stretcher. Write a review about Stretcher.